In the coming months, we’ll see the Roche Accu-Chek Connect system hit the market here in the States — giving us the first mobile app approved by the FDA that actually offers insulin dosing recommendations, via a built-in bolus calculator. 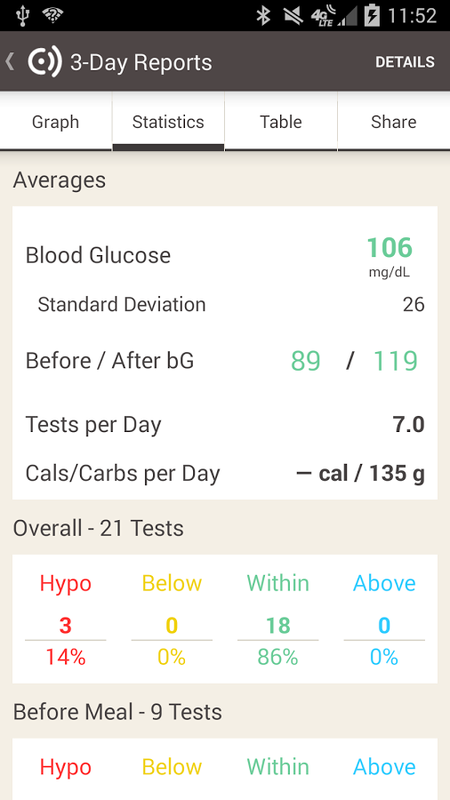 Yes, this app will go where none have gone before — offering the convenience of telling us how much insulin is needed based on the blood sugar results and carbs the user keys in. This makes it useful especially for insulin-users on Multiple Daily Injections (MDI) who don’t have access to a bolus calculators on an insulin pump. The new Acc-Chek Connect meter is really a refreshed version of the predicate Accu-Chek Plus meter that’s been on the market for years, now with updated features and design along with the capability to communicate with the companion app using Bluetooth Low Energy, sending blood sugar data to the cloud, and even allowing that data to be shared by text message. But don’t get too excited yet. So far the FDA has only approved the Android version of the app, and Roche isn’t planning to launch the system in the U.S. until the iPhone-compatible version is finalized. But waiting is a debatable move, depending on who you ask — take Dexcom’s release of the CGM data-sharing system known as SHARE, which is available for iOS now but not yet for Android (expected to come this summer). Perhaps users would prefer to get their hands on what’s available now, rather than waiting for the whole enchilada. And there’s another rub: even before Accu-Chek Connect is launched here the U.S., this new system is already clouded thanks to a brief recall. On April 3, the FDA issued a Class II recall on the Accu-Chek Connect app after internal company testing found instances of inaccurate bolus recommendations. 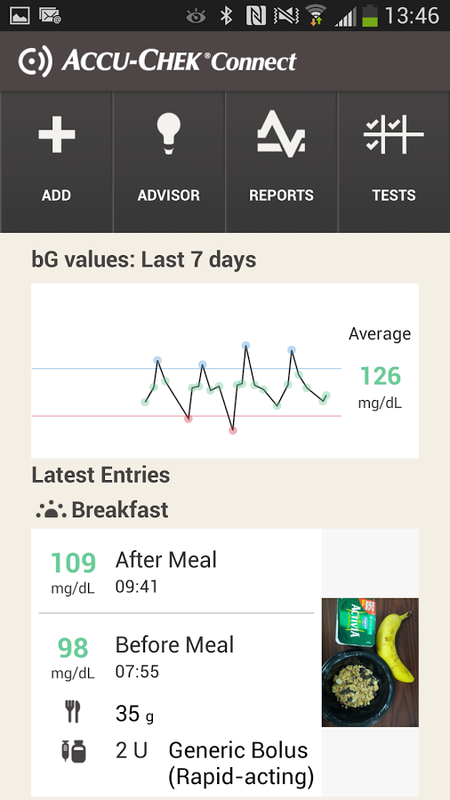 Apparently, the bolus amounts would be blanked to 0 when the phone landscape changed between vertical to landscape (!). No external reports were filed and no one was injured as a result, and Roche quickly fixed the issue with a software patch, so it should be be a non-issue by the time of launch here in the States, we’re told. AG) The new ACCU-CHEK Aviva Connect blood glucose meter is part of a diabetes management system that also includes the ACCU-CHEK Connect app and online portal. The meter wirelessly transfers blood glucose results to the ACCU-CHEK Connect app on a phone via Bluetooth Low Energy, allowing a parent to manage their child’s diabetes from anywhere at any time. 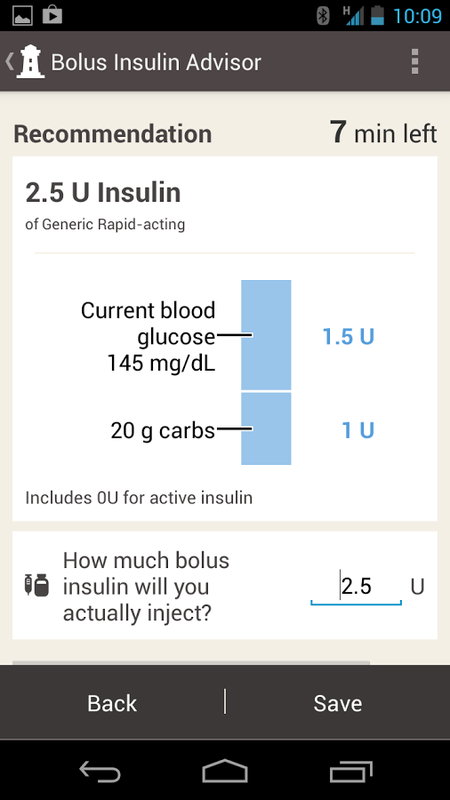 The innovative app marks the first FDA clearance of an app with a built-in prescription insulin bolus calculator, the ACCU-CHEK Bolus Advisor, on a smartphone or tablet. The proprietary bolus calculator is activated and configured by the physician of a person living with diabetes and provides bolus recommendations based on his or her physician’s guidance using the current blood glucose, planned food intake and insulin therapy settings. Bolus Advisors have been shown to facilitate the optimization of glycemic control in patients who are trained in MDI therapy and under the supervision of HCPs experienced in managing insulin-treated patients. The ACCU-CHEK Connect app is the first and only FDA-cleared app with a bolus insulin calculator. Using the current blood glucose result, planned food intake and the person’s insulin therapy settings based on his or her physician’s guidance, the ACCU-CHEK Bolus Advisor offers bolus recommendations on the screen. These are valid for a limited time only, after which the system will ask for a new glucose test to refresh recommendations. Who’s the meter targeted to in the patient community? Any person with diabetes can use this system; however, parents of children with diabetes may find the system most helpful because it allows them to receive text messages containing their loved ones’ blood sugar results and allows them to view those results online in real-time, even when they’re not together. Does the meter actually have a bolus calculator built-in as well, or is it just the app? No, the meter does not. It’s only on the app. If you don’t have a smartphone or use apps, then you have another option with the ACCU-CHEK Aviva Expert that does have a built-in bolus calculator. Those two meters do not communicate, but you can use a cable to connect them all using the Connect software. You’ve created a proprietary app here. What about the open data platforms and data sharing capabilities that our D-Community has been clamoring for? Roche is very supportive of non-proprietary data sharing and has been actively involved in the Continua Health Alliance since it was created. We currently have multiple glucose meters that are Continua-compliant for the USB interface standard and our Accu-Chek Connect meter is compliant with both the USB and Bluetooth Smart protocols for Continua. We have also been actively involved in helping to define the Continua protocols for insulin pumps and continuous glucose monitoring and plan to support these in our future products. 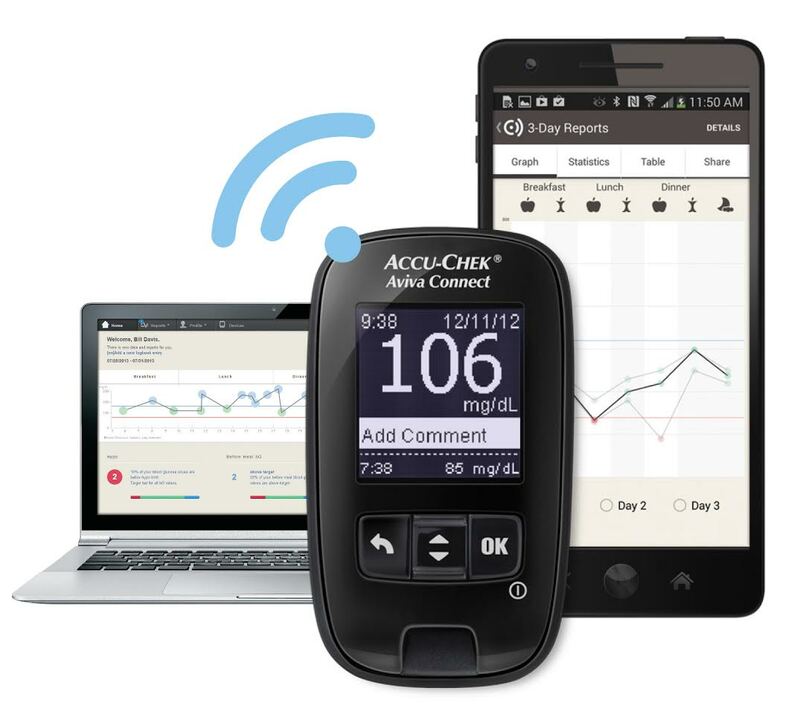 Since the new Connect meter is Bluetooth-enabled, does it communicate with the Accu-Chek Combo insulin pump, a device heavily promoted in 2012 as having two-way Bluetooth? No, it does not. The Aviva Combo meter only connects with the Combo pump. But as noted, you can combine all the data using the Roche software. When and where can we get one of these meters, and how much will it cost? The system will be broadly available once we receive clearance for the iOS version of the ACCU-CHEK Connect app from the FDA. Although we are working with the FDA, we cannot speculate on the timing of FDA clearance. Distribution details for are in the process of being finalized and will be announced at the time of the product launch. The ACCU-CHEK Connect app and online portal will be free to the public. What caused the app recall, and how was it discovered and resolved? During a Roche Diabetes Care internal analysis, an issue was discovered that could potentially lead to inaccurate bolus advice provided to the user via the smartphone app. The issue, which was quickly fixed, may have occurred if the user changed the screen orientation of the phone from portrait to landscape or vice-versa while looking at the Bolus Advisor or Carb entry screens. As soon as we discovered the issue, the Prescription Activation Service for the bolus recommendation feature of the app was immediately disabled, so that new users could not activate bolus advice. We informed healthcare professionals and users of the app in affected countries to be aware of this issue. A fix was available within days. A new version of the app was made available and the Prescription Activation service for the bolus advisor was enabled again. In a matter of weeks, most app users had already upgraded to the new version of the app. No affected versions of the ACCU-CHEK® Connect app were released in the U.S., and there were no serious injuries reported. How widely has the app already been downloaded internationally? At the time of the recall, the application had been downloaded a total of 644 times (Italy-219, South Africa-24, Germany-401) and there were 113 bolus advice activations. No affected versions of the ACCU-CHEK Connect app were released in the U.S. Does the Accu-Chek Connect tie in with Roche’s plans to bring the color, remote Accu-Chek Insight pump to the States? Roche Diabetes Care is committed to advancing technology that integrates seamlessly and effortlessly into peoples’ lives. Unfortunately, we are unable to comment on the status of ACCU-CHEK Insight at this time. What about the mythical Solo patch pump you bought in 2010… last we heard three years ago, it hadn’t even been submitted to the FDA. Any updates? Roche Diabetes Care is committed to bringing our micropump technology to market. Unfortunately, we are unable to comment on our regulatory status at this time. OK then. Can we expect to see anything cool from Roche at the upcoming ADA Scientific Sessions in June? We currently do not have any presentations planned at the ADA Scientific Sessions, however we will be exhibiting at the American Association of Diabetes Educators (AADE) meeting in August in New Orleans. We certainly applaud Roche for finally entering the mobile health space and “connecting” more of its diabetes data. However, we’d love to see this going even more in the direction of truly open systems with how their data is shared, i.e. #WeAreNotWaiting. But tip-toeing down the road is still moving forward, right? Disclaimer: Content created by the Diabetes Mine team. For more details click here. This content is created for Diabetes Mine, a consumer health blog focused on the diabetes community. The content is not medically reviewed and doesn’t adhere to Healthline’s editorial guidelines. For more information about Healthline’s partnership with Diabetes Mine, please click here.